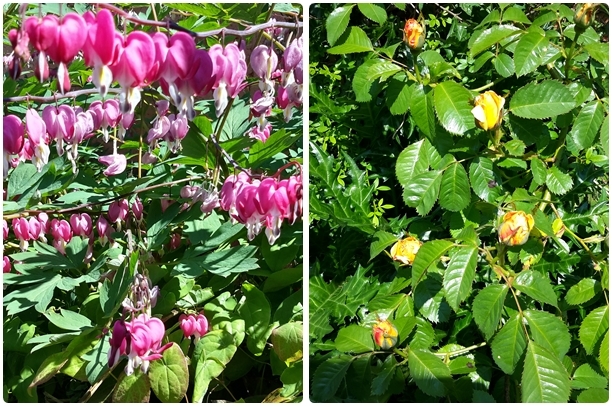 English summer, or spring even, don’t always turn out to be what we expect. And that’s fine by me. I don’t think I could live somewhere the weather never changes. I like surprises - be they weather related or not. We had a couple of lovely days out recently that reminded me of that. At the tail end of Easter we spent a day in London exploring the Inns of Court and the Royal Courts of Justice. At the time I was doing research for a story and thought I had an idea of what I was looking for and at. Only to see a notation on the map directing us to the London Silver Vaults. And if I’ve ever been surprised…. Really, if you find yourself in London and are near Chancery Lane, take half an hour and head down into the Vaults. They’re literally underground and filled with anything you can imagine making from silver. The vault doors alone are story material and well worth a visit! Photography wasn’t allowed when we were there, but I’ve found this article which has some great images. Does this look like an interesting day out? Our other "unexpected" day out was at Packwood House in Warwickshire. Sitting in lovingly kept gardens including parkland and a collection of spectacular yew trees, Packwood looks to all intents and purposes like a Tudor home that has survived the ravages of time both inside and out. But that’s not what it really is. 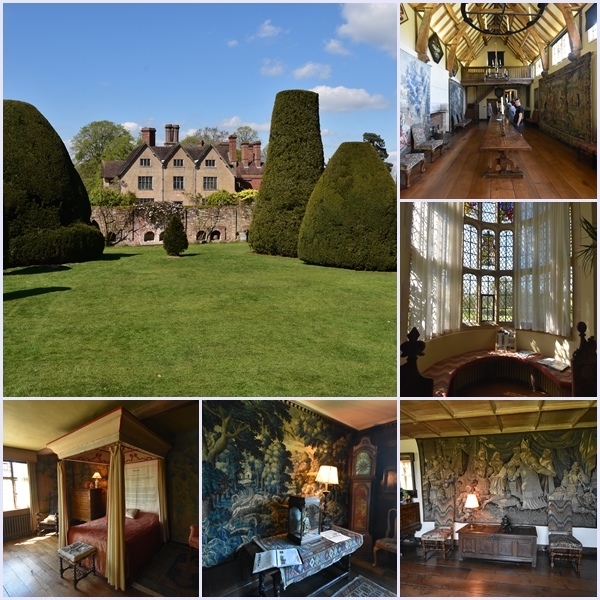 Packwood House is a collage, lovingly pieced together by its owner, Graham Baron Ash in the 1920s and 1930s. He scoured the country for furniture, panelling, drapes, tapestries, windows, staircases, lights and tiles in an effort to create the ultimate country house, rescuing many irreplacable items that would have been lost, destroyed or sold in doing so. The end result is an intimate house with a thoroughly homely feel and much wonderful period furnishing to look at and enjoy. Graham Baron Ash gave the house to the National Trust in 1941 - when he went off to restore a moated manor house in Norfolk - and it is much as he left it then. Along with its park, the famous yew trees and gardens - the kitchen garden is especially wonderful - Packwood House is a little jewel of Tudor style resurrected in the time between the wars… and it’s so worth a day of exploring. Holiday season has started. If you’re in the UK, or travelling our way this summer, you may be interested in one or the other of these fab offers I’ve just been sent from companies we’re using for our own holidays. LateRooms.com is a hotel booking site that offers very good deals on all kinds of England hotels from the grand to the functional. Tomorrow, Monday 8th May, they’re holding a City Flash Sale, including hotels in London, Newcastle, Manchester, Bournemouth, Chelmsford, York and Sheffield and offering deals from 10-50% off and early booking discounts. This link takes you to the main deals page. The city flash sale deals are only available tomorrow, so keep an eye on the LateRooms website, the England blog or the Essentially England Twitter feed if you’re interested in booking a deal. Cottages.com, England’s biggest holiday cottage website, have some great deals on at the moment. If you’re still looking to book a cottage holiday, check these out. Up to £100 off Summer Breaks – only this weekend! T&Cs: Cottages.com currently feature a selection of properties across the UK with reductions of up to £100 off on arrivals between 30th June and 26th July 2017. The reduction is valid for 7 nights Ends: 8th May at 8pm. May half term hundreds of breaks from £299 only! If there’s one thing I wait for with barely concealed impatience every year it’s English asparagus. For me, there’s nothing quite like the green spears we get here. Not the plump, white variety I grew up with, and certainly not the supermarket offerings imported from across the ocean. Those are useful when I want something a little different for dinner, but English asparagus is a pure indulgence. And this year, the season started early. The greengrocer in the next village had his sign out before St. George’s Day… so of course I was there like a flash. And what followed as an Easter Weekend filled with delicious green spears in all our favourite dishes. Steve’s favourite is griddled asparagus on toast with olives and shaved parmesan, drizzled with a grassy green olive oil and aged balsamic vinegar. Mine has to be griddled asparagus with Hollandaise Sauce. It’s always the first dish I make to ring in asparagus season. Griddled asparagus (can you see the theme here?) with garlic mayonnaise is equally good. Why the griddle? I find it concentrates the flavour and there’s less chance of overcooking the delicate heads. It doesn’t take any longer than steaming, frankly. Just wash your spears, snap off the woody ends and rub very lightly with olive oil. Hot griddle, a few minutes depending on the thickness of the asparagus spears… and there’s dinner! As for the image top left… that’s a new favourite. We first had asparagus tempura in Tokyo - along with tempura avocado! - and we were immediately sold on the idea. Crackling, crispy batter and soy sauce is all that’s needed to make this a fantastic meal. These are the first treats of the year. 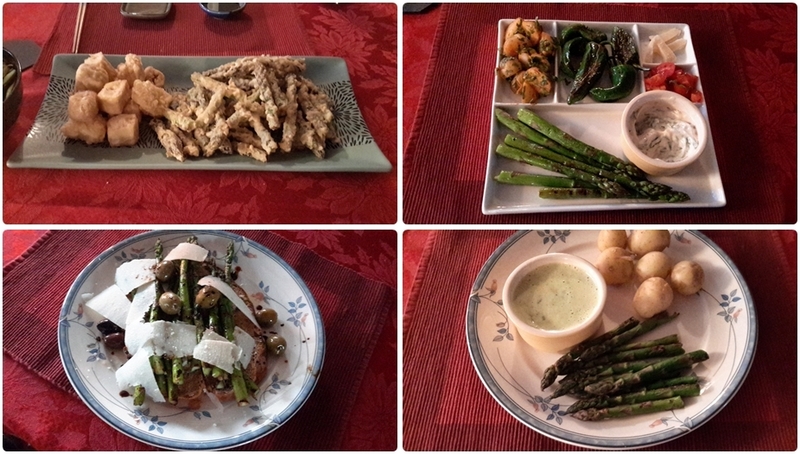 Now that the season gets going I’ll dig out my other asparagus recipes and look for new ones to make. And one or two of those I’ll intend to share in next month’s newsletter. For the moment, this is all from us. Tomorrow morning, I'll be doing my first live radio interview talking about England! And if the weather gets to be a little more reliable, there are bound to be a few days out on my calendar. Next month, of course, I'll be talking about wigs and gowns and the beautiful Inns of Court, that are like a city in itself.